Do you ever reach the end of the month and look at the balance in your bank account and wonder, ”What did we spend all of this money on?” The Trustees of the Yachtsmen’s Fund are experiencing that same feeling this month, but view it as a blessing rather than a curse. We were delighted to award grants to NINE sailors from I-LYA, who qualified for Chubb Jr. Championships. We work hard to fundraise and provide $100 per sailor for housing at Jr. Bay Week (Junior Championship), as well as scholarships for first, second and third place finishes, male and female sportsmanship, and coaching for both Jr. power and sail. There are more exciting events being hosted by I-LYA Clubs next summer with Mentor hosting Ida Lewis and NCYC hosting Chubb Jr. Championship. Thanks to all who support the Yachtsmen’s Fund – you help us continue to support the endeavors of the youth in I-LYA! Pictured (L-R) are Ian Reimel (GIYC), Joseph Lark (NCYC), Luke Schumann (CLSA/HSC), Meghan Dieball (GIYC), Henry Rolander (CLSA), Bryn Irvine (CLSA), and Ryan Squires (HSC). Missing from the photo are the C420 team from Chautauqua, Cameron Turner and Chase Stevenson. Nine I-LYA sailors qualified at the Area E Championships held at Hoover Sailing Club in July to represent Area E at the Chubb US Junior Championships which were held in Tom’s River, New Jersey from August 8-11. Thank you to the families and clubs of these young sailors who also supported them and thank you, sailors, for representing I-LYA. 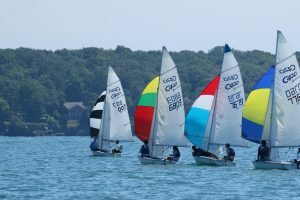 Three past Junior Bay Week champions: Matt Fisher, Wayne Pignolet, and Ian Moran, teamed up to win this year’s Thistle Great Lakes held in conjunction with Cleveland Race Week at Edgewater Yacht Club in June. Matt, representing BLYC, won the Sears qualifier as crew in 1972 and then as skipper in 1973. Wayne Pignolet skippered the winning thistle for MHYC a few years later in 1976. Ian Moran from EWYC skippered the winning C420 in 2014, 2015, and 2016. A quick look at the results shows quite a few past and current I-LYA junior sailors racing thistles–many of them competing with and against friends they made at Junior Bay. The Yachtsmen’s Fund is proud of their long history of supporting junior sailing and the I-LYA Junior Championship with the goal of creating lifelong sailors and boaters. What a great sport we have. Champions spanning over 40 years sailing together and we all win! Jet 14 Women’s and Junior Champs! 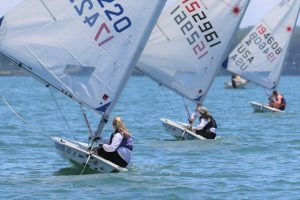 Former I-LYA junior sailors Samantha Moran and Maggie Hoffert won both the Jet 14 Junior National Championship and the Jet 14 Women’s National Championship which were held at EWYC on August 9th. Nice job girls! And thank you EWYC for hosting the Jet 14 Nationals. 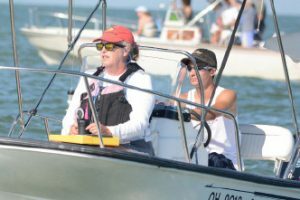 Cowan Lake opti sailor Sara Schumann continues to find success in 2017. She finished 1st at Centrals Sodus Bay, 1st at Team Race Nationals, 4th at Girls US Nationals, and was 1st girl at CORK and 4th overall out of 168 sailors in Canada. Sara is pictured with her teammates on the podium at Team Race Nationals. The win at Team Race Nationals qualifies the team to represent the US in Berlin in October. Good luck Sara! Safe travels! This year’s I-LYA Optimist Championship (held at Hoover Sailing Club in conjunction with the final traveler series event) was won by EWYC sailor Jack Vanderhorst. Jack, age 13, is pictured with his grandparents, Yanny and Karl Vanderhorst, olding the Gunkler Family Trophy. Yanny and Karl were the driving force behind the I-LYA Optimist Challenge which used to be held on the Friday of Junior Bay Week at PIBYC with the support of the Yachtsmen’s Fund. In addition to the Gunkler Trophy, Jack also was awarded the Jeb Memorial Trophy for finishing first overall in the Traveler Series. Jack is the son of Kathy and Sjoerd-Jan Vanderhorst. Sjoerd-Jan won the laser fleet at JBW in 1986 and 1987 and the thistle fleet in 1988. Kathy skippered an FJ for Sandusky Sailing Club, finishing top five in Bemis in 87, 88, and 89. In 1989, she was also awarded the Com. Art O’Hara Trophy for individual female sportsmanship. The tradition continues. In addition to working as instructors at Edgewater Yacht Club this summer, Ian Moran and Abie Griggs are getting to know a new boat. If you’ve seen an Olympic class 49er on the water in Cleveland this summer chances are it was them. A heavy air adventure at CORK provided some on the water/in the water training, but the boys are up to the challenge. Ian is a senior at Rocky River High School this year and will be doing some high school sailing. Abie is heading back to Wake Forest for his sophomore year. 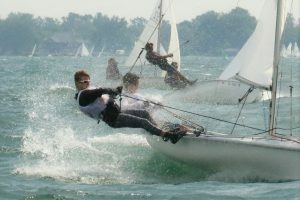 Both were extremely successful in the opti and c420 classes, sailing locally, nationally, and internationally. They like to go fast. This new boat has wings and will fly!